Sensitive people don’t come with a logo. They are just like every other person you come across, just with hypersensitivity to external stimuli, a greater depth of cognitive processing and high emotional reactivity. Little things? Well, they aren’t so little to them. And the sad part is, there isn’t a lot that they can do about it. It’s just a trait in them. They are empaths by nature and hold the capacity of feeling every emotion too deeply. It’s an overwhelming feeling and they don’t really enjoy it. They are a tough nut to crack. Understanding a highly sensitive person is twice as laborious as understanding a normal person around you. They don’t often open up to people and even if they do, they take a lot of time to do so. It does get a little annoying for people around them to reach out to them, but I assure you, this isn’t something in their control. Maintaining relations with them is really tough because they often do not have a typical reaction to things. Don’t get them wrong but they do not intend on coming forth as rude. They just feel tired of feeling a lot which is why they prefer staying by themselves. After reading this I’m sure you can relate all of this with at least one person in your life. 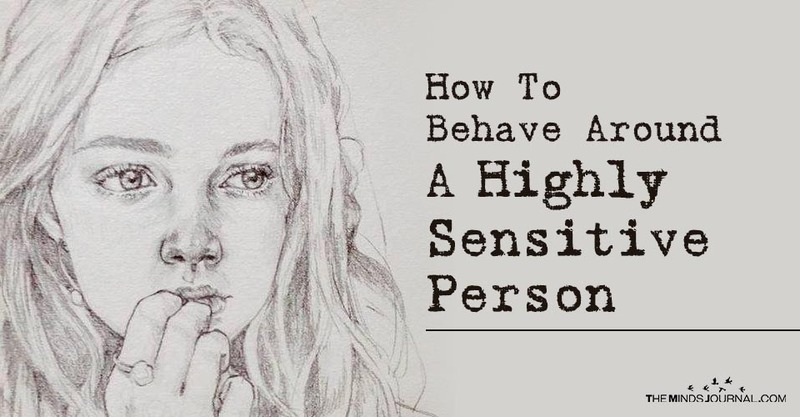 Here are the things you need to keep in your mind when you have a highly sensitive person in your life. 1- Don’t push them a lot. Do not pressure them to talk to you. They require their own time to open up to people. But when they do, it’s an indication that you mean something to them and they consider you to be really close to you. You need to make them comfortable around you. That is the only time they will open up to you. 2 – They can detect your flaws. It is a lesser known fact that sensitive people can detect flaws in others very easily. If they are close enough to you, they can even criticize you for it openly for your betterment. This just proves that they are comfortable enough to speak their mind in front of you. Sensitive people have a very sharp eyesight which is why nothing misses their eyes. 3 – Keep a check on your volume. You need to keep a strict check on your volume when you’re talking around a sensitive person. They are highly scared of violence and loud behaviors. This will only push them deep into their shells. They don’t enjoy atmospheres which aren’t peaceful. So be conscious of your vocal volume around them. 4 – Don’t plan last minute. They hate being included in last minute plans. They’d rather be alone at home than being a part of a ruckus. They do not like disorganized plans. 5 – Do not disturb when they are working. They have a very high sense of focus when they are working. They hate when people joke or disturb them while they are trying to achieve a set goal. It breaks their concentration.